Schedule today to have your new walkway planned and paved! Nothing ties together your home’s elegant exterior design like carefully-crafted paver sidewalks and walkways. These beautiful paths provide a constant link between the different areas of your property, and can be the perfect way to emphasize your thoughtful design choices. Pavers are the perfect material for creating these types of pathways; they’re versatile and durable, as well as safe for all weather conditions. Pavers bring an enormous amount of flexibility to the design process. You’ll have a huge selection of materials and designs to work with. You can choose from elegant slate-gray cobblestones to honey-colored Mediterranean flagstones, amongst almost anything else you can picture. Our talented design team will provide plenty of professional input to ensure your path turns out looking exactly as you pictured it. Pavers have excellent drainage and grip properties. This means that no matter what the weather’s like, you’ll always have a safe and easy-to-use walkway if you choose this paving option. Other options, such as concrete, don’t let water drain properly. Pavers are set in sand, and they naturally allow water to filter away into the earth, preventing puddles from pooling on your pathways. Walkways can be damaged throughout their long lives, and while pavers are particularly durable, some of them can start to wear down or fracture eventually. Because they’re made to a uniform size, though, it’s very straightforward to replace damaged pavers. There’s no digging up surfaces or pouring concrete over cracks; the sidewalk repairs will be far simpler and quicker. You can’t do better than a custom-designed paver walkway. If you’re thinking of tying your home together with the perfect paved sidewalk, get in touch with our team today and consult with us on the different options available to you. At S&P Hardscape Remodeling Los Angeles, we believe in meeting every customer's expectations, and we'll be happy to bring your ideal design ideas into life. Can you build a paver walkway on a slope? 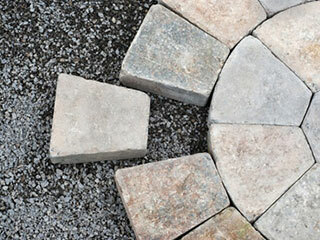 Our experienced team can definitely build a paver walkway on a slope. Because the bricks need to be laid on a firm and even foundation of paver base and sand, the layout of the area must first be carefully examined and the gradients of the terrain need to be taken into consideration. In short, some careful planning is required. Slight slopes can support better drainage, while the walkway itself can curve around large obstacles such as large rocks, giving the design additional features. If the slope is too steep, the walkway can include wide steps or terraces, with the pavers used for the construction of the stairs or as individual stepping-stones. When designing the walkway, special attention should be given to drainage and the flow of rainwater to avoid the formation of large puddles during the rainy season. What are some unique sidewalk design ideas? Design ideas for walkways are as plentiful as the style and taste of the property owners. The design can match that of the house or the physical and geographical location, it can be an integral part of the overall landscape – or not. The most common materials used are bricks or pavers, laid in a range of patterns like herringbone, basket-weave, running bond and more. Bark mulch is great for an economical and environmentally friendly option, as are wood slices. A sparkling path made of recycled tumbled glass mulch is another beautiful design idea. Stepping stones, or large stones over grass, are often used as a simple solution, but planting herbs like thyme between the stones adds a special fragrance to strolls along a low-maintenance garden path. Mosaic pebble or stenciled concrete can give you near-unlimited artistic options. At the end of the day it’s up to you, but if you're looking for some useful advice and suggestions, our experts will be happy to help. Can you give me some walkway ideas for front house design? A new walkway can add to the curb appeal of your property. If you are considering a brick path, it can have a straight or curved layout, in a mosaic or herringbone pattern; paver walkways can be built in a simple or elaborate pattern in any shape, colors or textures you like. Even more versatile is the option of combining different materials to create geometrical combinations of pavers, bluestone and large planters, or that of brick and bluestone. Some specific ideas that you might want to consider: using flagstone on concrete to incorporate a seating arrangement and turning the walkway into a “meet and relax” type of environment; building a stone retaining wall and steps, and expanding the porch in front of the house. For more ideas and advice, get in touch with our team.